This chapter provides a model charter and a conclusion to the book. The contents of the Model charter to prevent online victimization of women are: Part I: Purpose, Part II: Definition, Part III: Proposal for cyber rights for women, Part IV: Proposal for a code of conduct in the cyber space, and Part IV: Proposal for Promotion of researches on offensive cyber conducts targeting. In the conclusion we have strongly emphasized the need for new laws related to cyber crimes against women, both in less developed and developed nations. In addition, the need for more research works that analyzes cyber victimization of women is emphasized. Cyber behaviors of the users: When in the cyber space, adult users may behave in a strange fashion, which might be different from the behaviors in the real space. Many men and also women use the internet as a platform to express personal frustrations and angers in a language, which may not be treated as ‘protected speech’ in the real life. Cyber space does not victimize individuals’ suo motu. It is the manner of usage of the cyber space by the users that generates victimizations. Seeing from a feministic perspective, which is well supported by the international surveys, it could be assumed that women are the worst sufferers of atrocious behaviors of frustrated lovers and ex-partners, jealous colleagues, habitual bullies and antifeminist debaters in the cyber space. The cyber ethics and etiquettes developed by the users as well as the ISPs: Cyber behaviors of users may influence the development of cyber ethics and etiquettes that are followed by various popular ISPs, which may lay down their own terms and conditions for monitoring ethics and etiquettes. Free speech notion may be expanded to recognize the digital norms of speech and expressions. However, these ethics and etiquettes may not always reflect the expected social behaviors especially when the users belong to comparatively orthodox societies. In such cases, perpetrators belonging to these societies may take these ethics and etiquettes as the supportive elements to attack their female victims in the digital way in a manner that may not be legally or socially possible in their offline social and legal structure. Resultant to this, ISPs and social networking sites may get transformed in to platforms to practice several ethics and etiquettes such as publishing demeaning words targeting women, portraying women in indecent words, expressing personal feelings against women or users who are professing feminist ideologies through blogs in critical manner etc, which may be considered bad ethics and etiquettes in real life societies. Awareness among users: Victimization begins due to less or nil awareness among users about the advantages and disadvantages of using cyber space as a platform to express one’s thoughts and expressions. The more the users are aware of cyber norms, safety measures and good cyber ethics, the less will be the victimization rate in the cyber space. 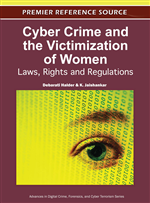 Less or nil legal recognition of the types of crimes and subsequently poor cooperation from the police and law and justice machinery could cause more victimization to women and may set very bad precedent for the next generation cyber perpetrators. Analyzing above contentions, we understand that a model charter for prevention of victimization of women in the cyber space is the need of the day. In the following segment, we have formulated a model charter, which could help to understand the nature of victimization and simultaneously prevent further victimizations of women in the cyber space. We propose a universal model charter for prevention of online victimization of women that could be used for the lawmakers to draft gender centric cyber crime preventive laws or even policy makers to create model guidelines for prohibiting cyber atrocities against women. Purpose: This model charter may be used to prevent online victimization of women / define various cyber offences that may happen to women online / prohibit several conducts as unethical and illegal and against the interest of women / spread awareness among men and women about cyber crimes affecting women / encourage government reporting agencies to understand the nature of the crime and thereby help the women victims etc.